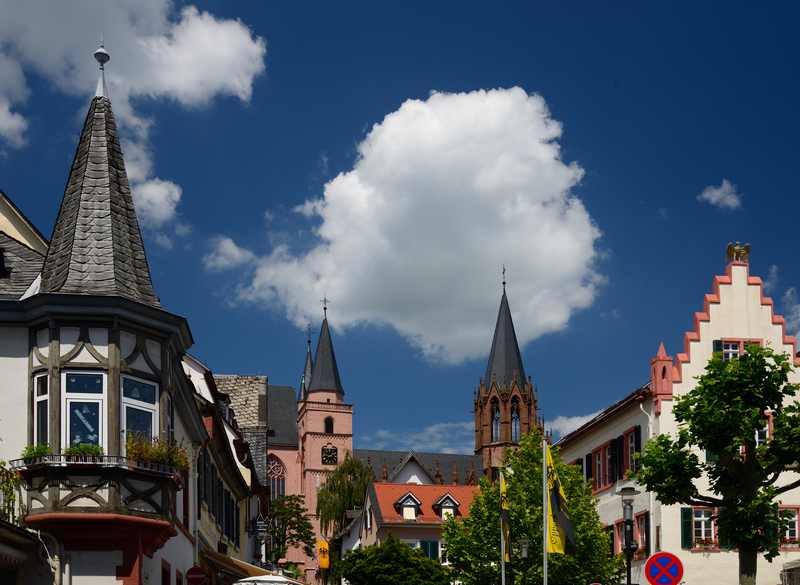 Oppenheim is a village about halfway between Mainz and Worms. 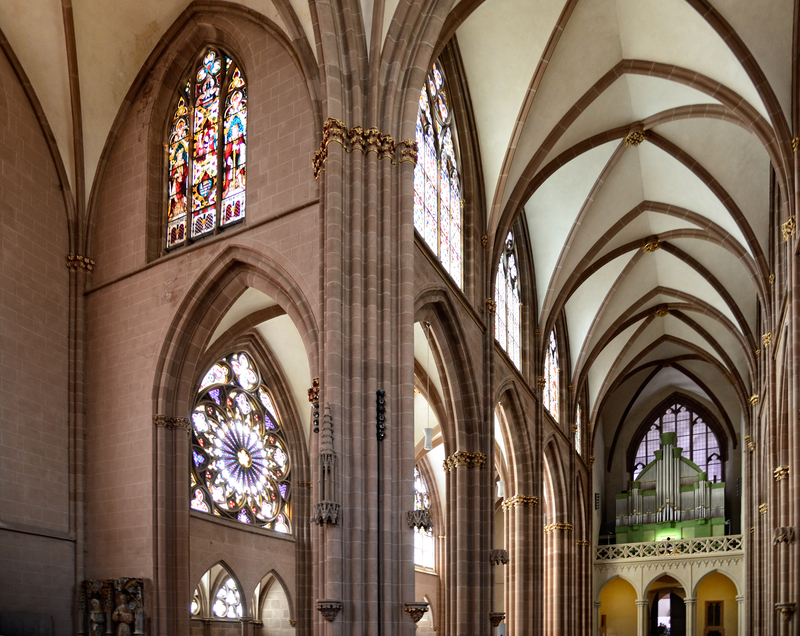 It’s well known for its underground tunnels and the Katherinenkirche (St. Katherine’s church, which was my main objective). Finding parking was a minor challenge as the streets are very narrow. We drove completely through town (which took all of 5 minutes), before circling back. We found a carpark on the other side of this medieval gateway just before a convoy of Fiats drove up. We took a quick look around, grabbed a cup of coffee at a cafe, and ate lunch before heading up the hill to the main attraction. Walk past the tourist information center to the church. 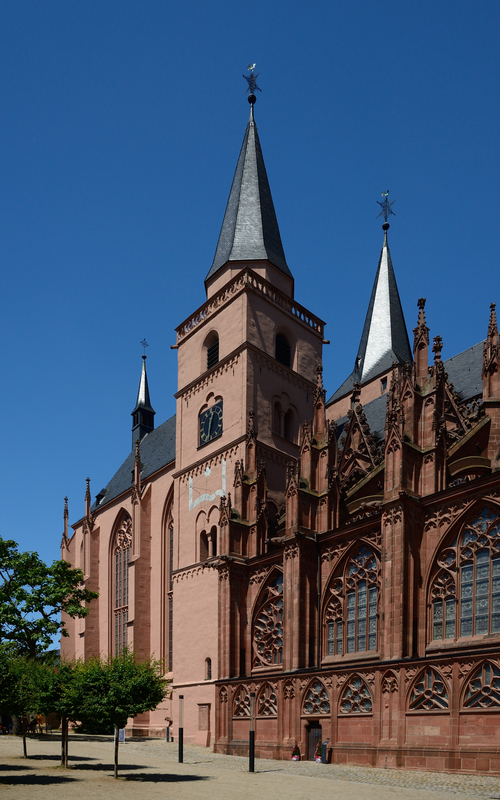 Katherinenkirche was built as a convent church and is now an evangelical (Lutheran) church. It was built in stages that can be clearly identified from the south elevation. The pink towers from the Romanesque era are the oldest visible elements. 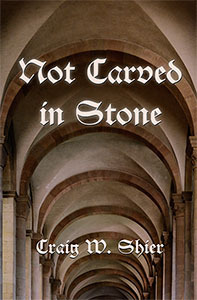 The darker, elaborate stone on the right shows the pointed arches, flying buttresses and tracery windows of the high Gothic era. The left, though plainer, is of later Gothic construction. From the inside the windows are spectacular. 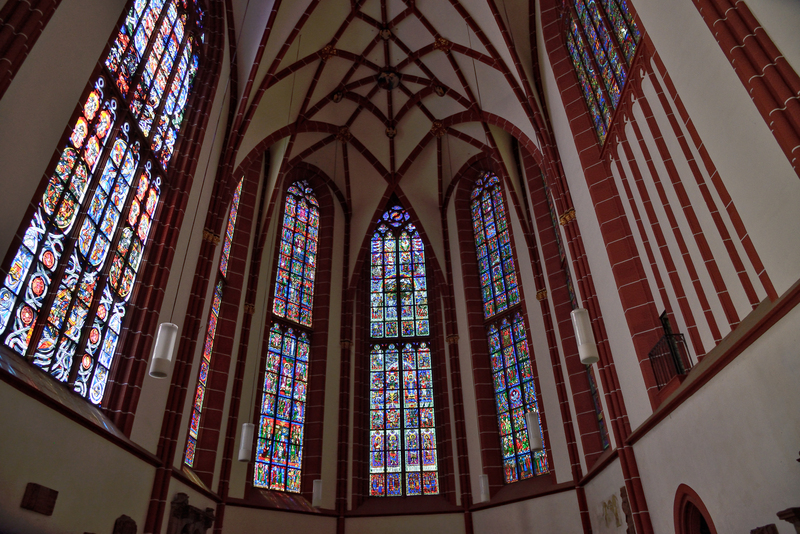 Though much of the original glass has been damaged through the centuries, periodic restoration and replacement of portions has kept them looking great. 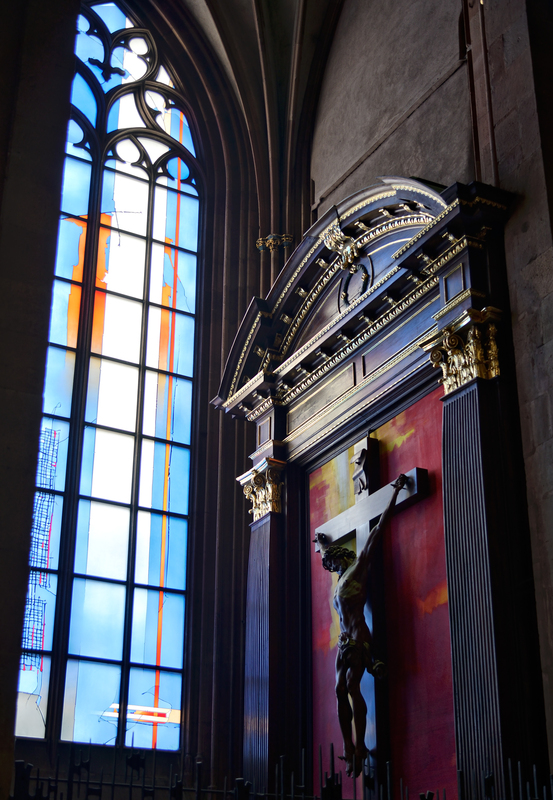 Even though the above window was dark colored, there are so many windows that the interior is brilliantly lit. 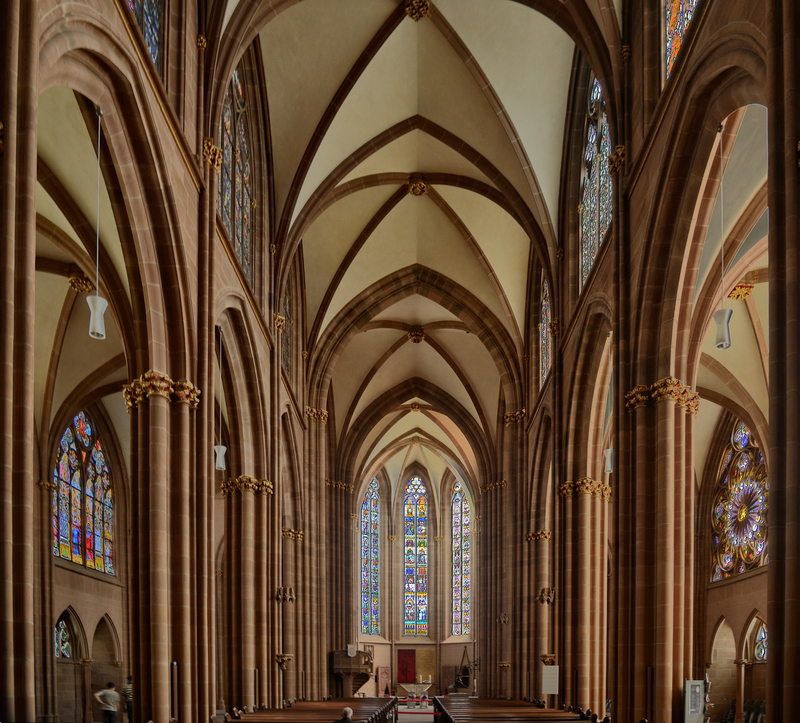 This is the nave of the high gothic section of the church. 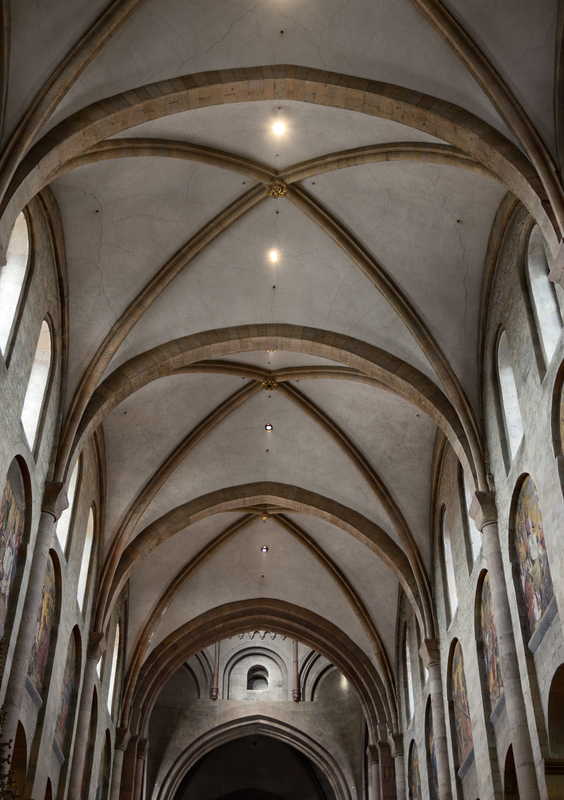 The graceful piers, with each shaft supporting a separate arch in the ceiling, create a rhythm and texture that keeps the eye in content motion. 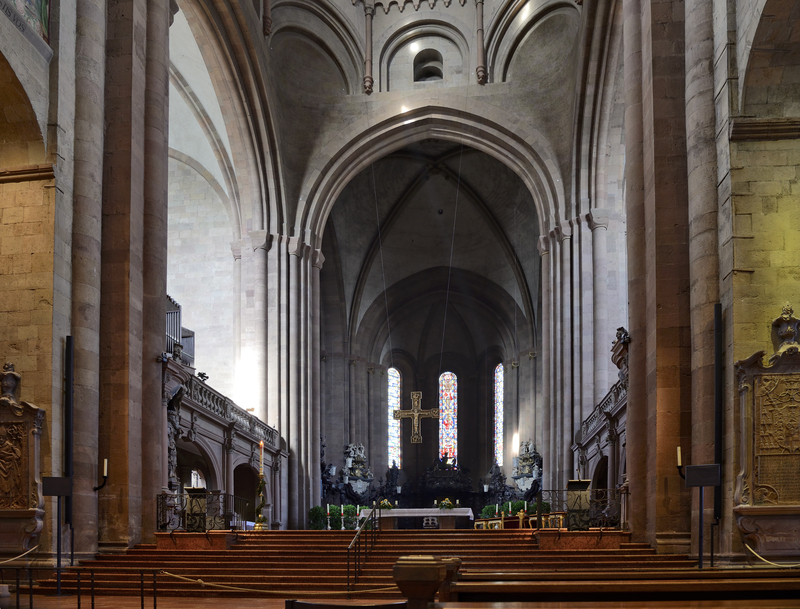 This next image shows the rear of the nave with the organ. 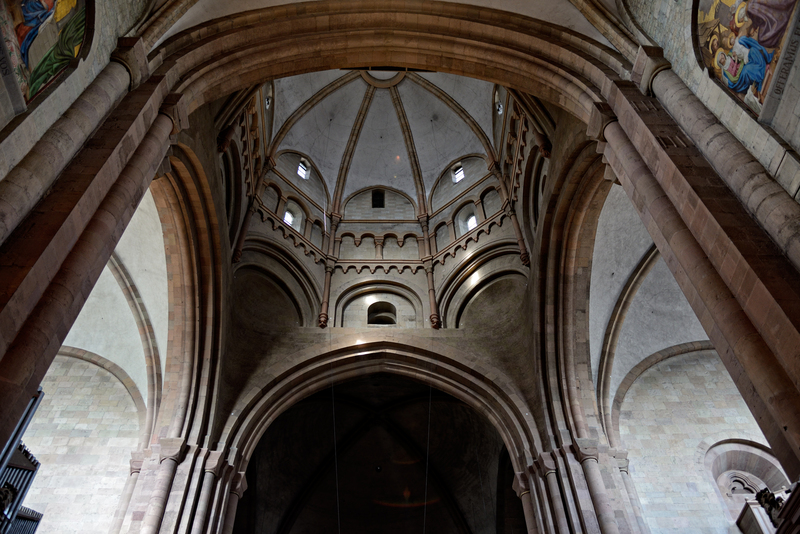 The west section has a raised area in the apse that shows it was once used as a second choir for the convent which was located on the north side. The entire church was severely damaged by fire in 1689. 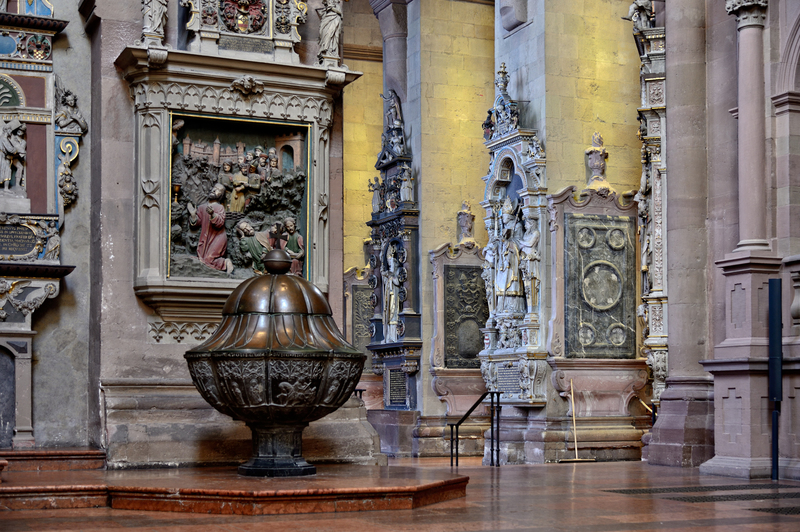 The nave and east choir were restored in the 18th century. The gift shops sells a set of postcards from 1876 that show the west choir as a roofless shell with large trees growing inside. This end was restored only in the 1880s after being a ruin for 200 years. Today it is empty of any furniture as there is some renovation taking place in the apse just below the level of the large windows. 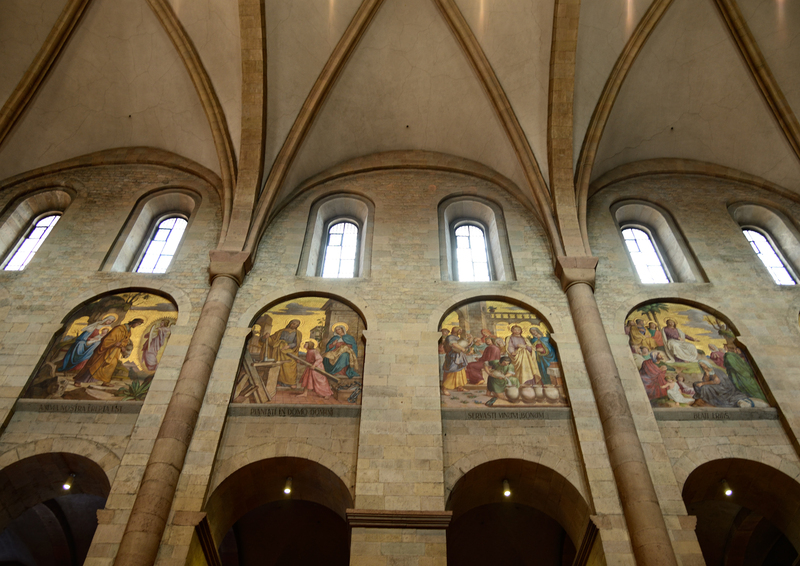 A few more images from the church and around town. 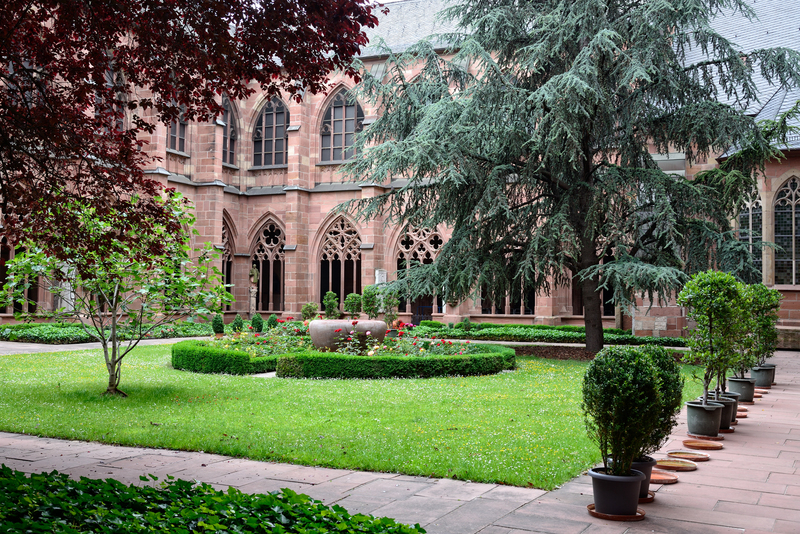 Ancient history and modern life go hand in hand in Mainz. 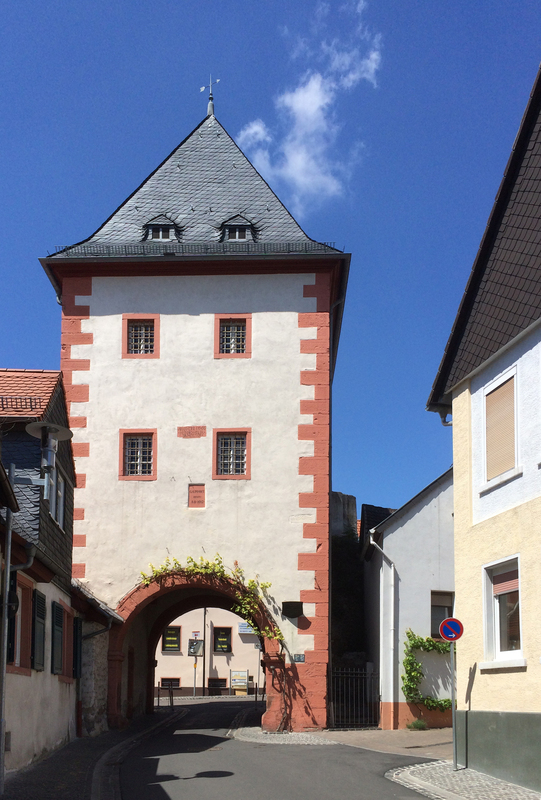 Close to the Frankfurt airport, it is a low-key and more personal alternative to the big city. The depredations of war have left only a few reminders of the past, but those are magnificent. Statue of St. Martin looks over the old city. Some features date to Roman times. 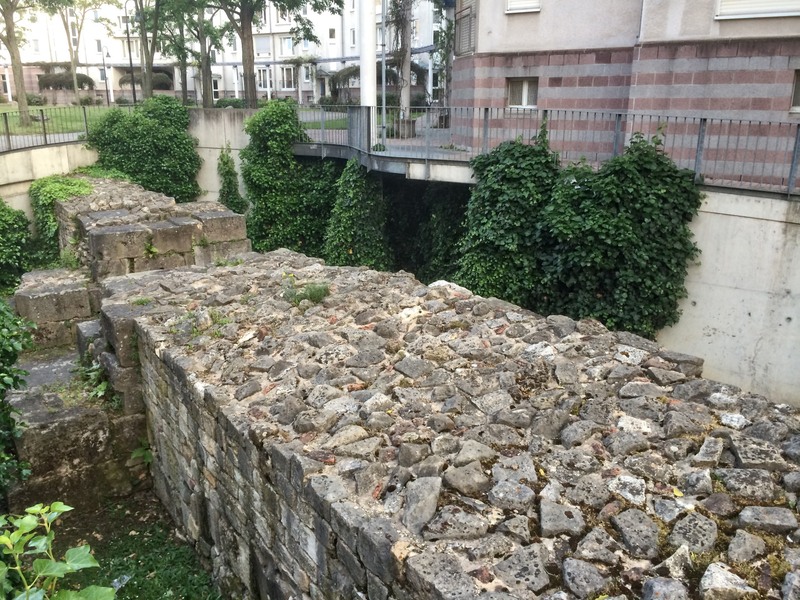 This wall from the 4th century was excavated near our hotel. You can clearly see that the exterior surfaces are well fitted, rectangular ashlars while the nearly 6 foot space between is filled with irregular rubble and mortar. Roman wall from circa the 4th century. 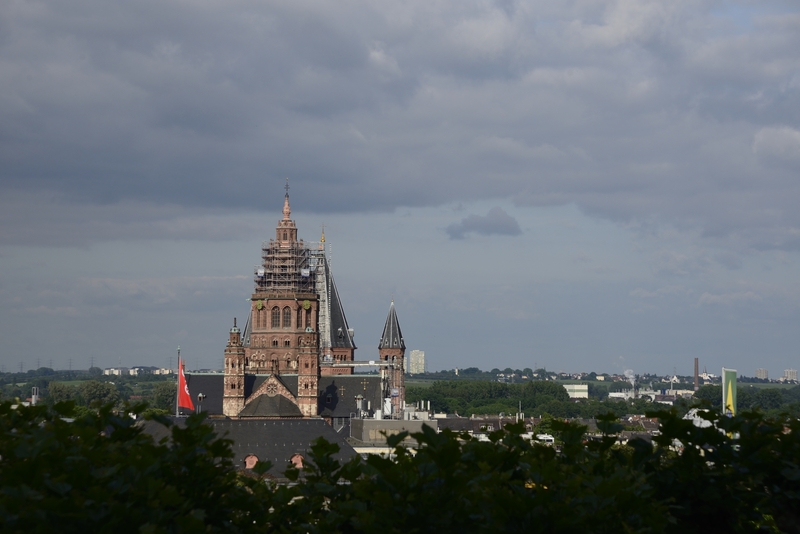 The Cathedral of St. Martin, much of which is 1000 years old, dominates the skyline. 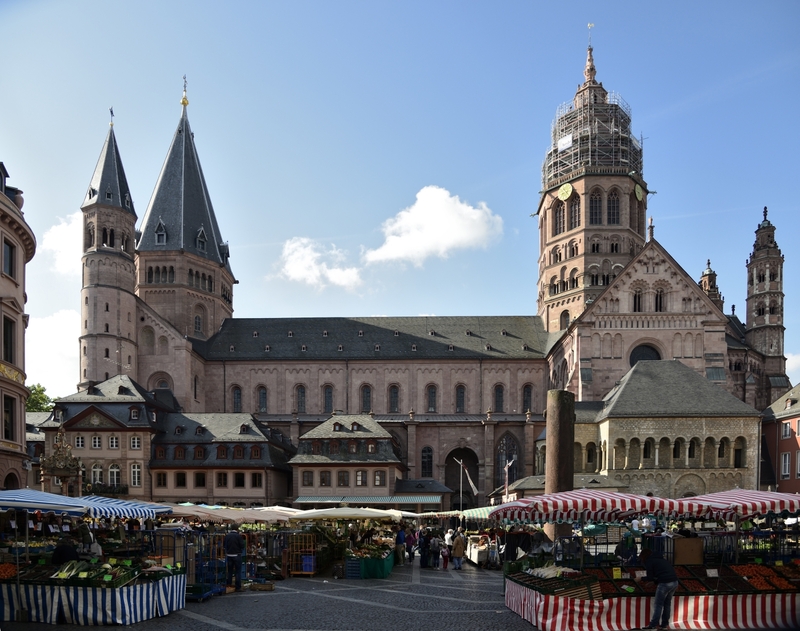 The marketplatz around the Cathedral is filled with fruit, vegetable and flower vendors. There are plenty of tourists, but residents are fully represented. Ancient cathedral looms over the marketplace. To the immediate north of the cathedral is a modern shopping area. 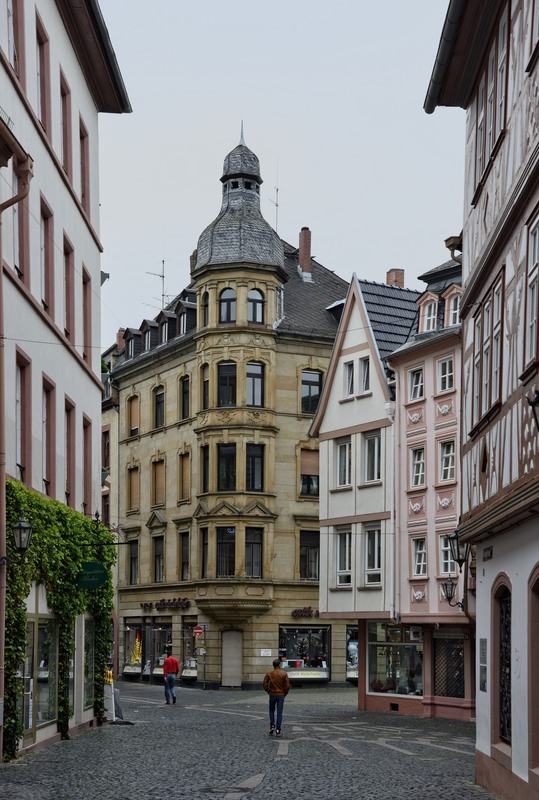 To the south is a surviving quarter of older buildings filled with boutique shops. Any way you turn, there are cafes and restaurants where you can take a break and watch the rest of the world go by. Much of the old city is pedestrianized and bicycle travel is popular. Keep an eye out for buses and street cleaners though. They can go where automobiles are prohibited. Augustinerstraße with shops and cafes. There is a walking/bike path along the river enjoyed by runners, bike riders and sedate strollers. 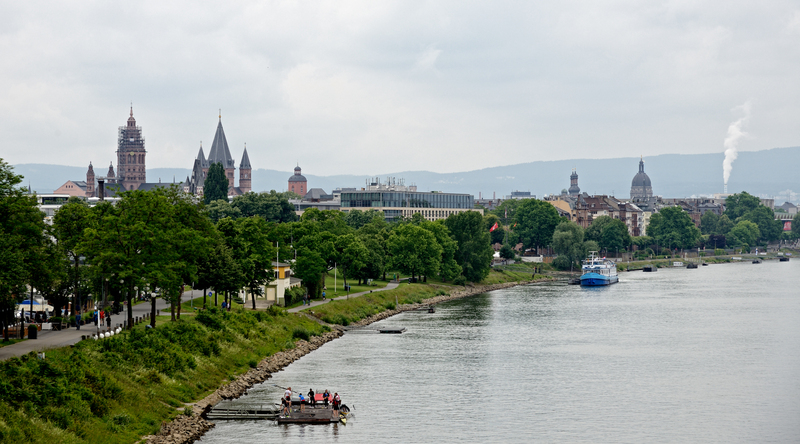 Rhine River with city skyline and riverwalk. On holidays you are likely to see revelers out as well. 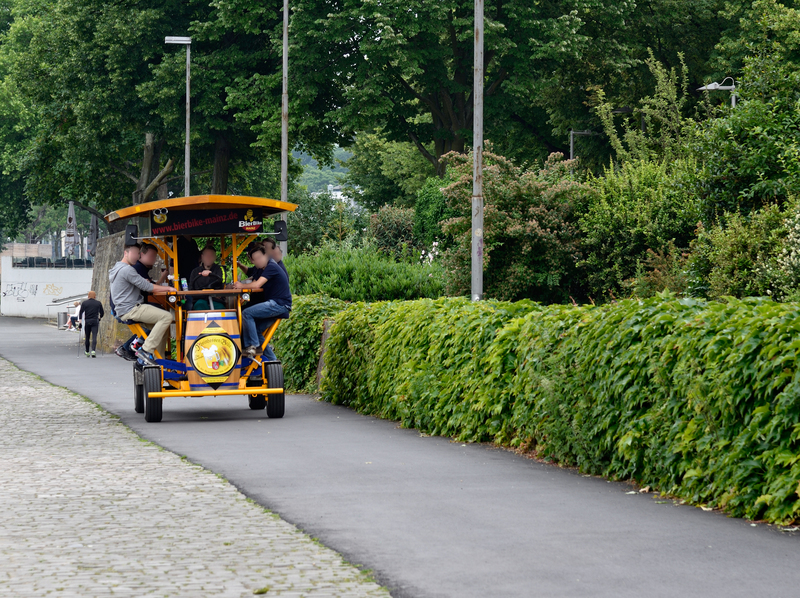 The riders of this “bier bike” provide motive power while the bartender keeps them from getting thirsty. If you fall off the wagon, you can ride this one. There is plenty of interesting architecture. 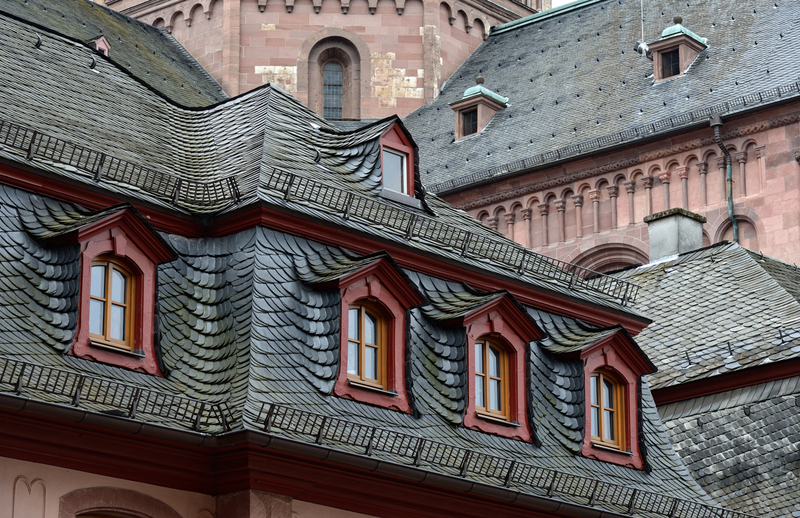 These fancy slate roofs remind me of dragon scales. Martin of Tours is the patron saint of the cathedral. 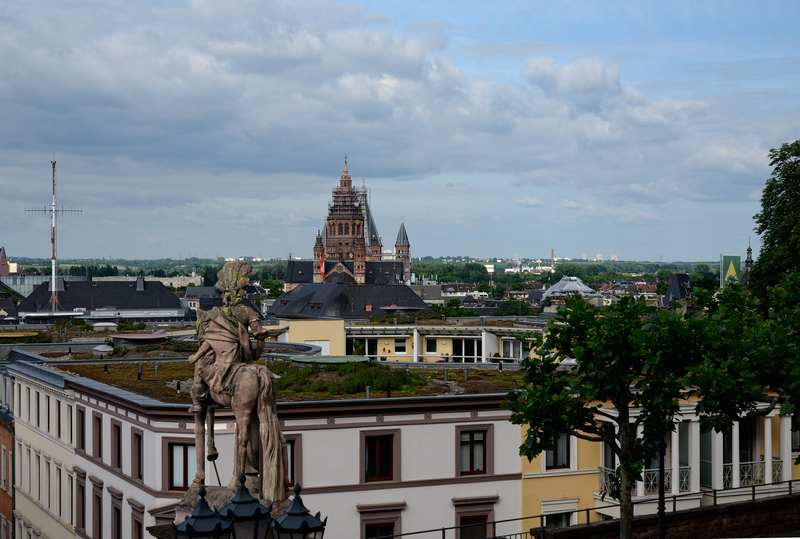 This statue on a terrace overlooking the city was made for the cathedral. Another statue that from the ground looks identical stands on the roof ridge of the west choir. This modern statue of Martin depicts the soldier dividing his robe to give to a beggar. Click on the thumbnails to see bigger images. Martin was a Roman soldier, thus the fancy hat. The pigeons are modern. Martin cutting his cloak in half for a beggar. 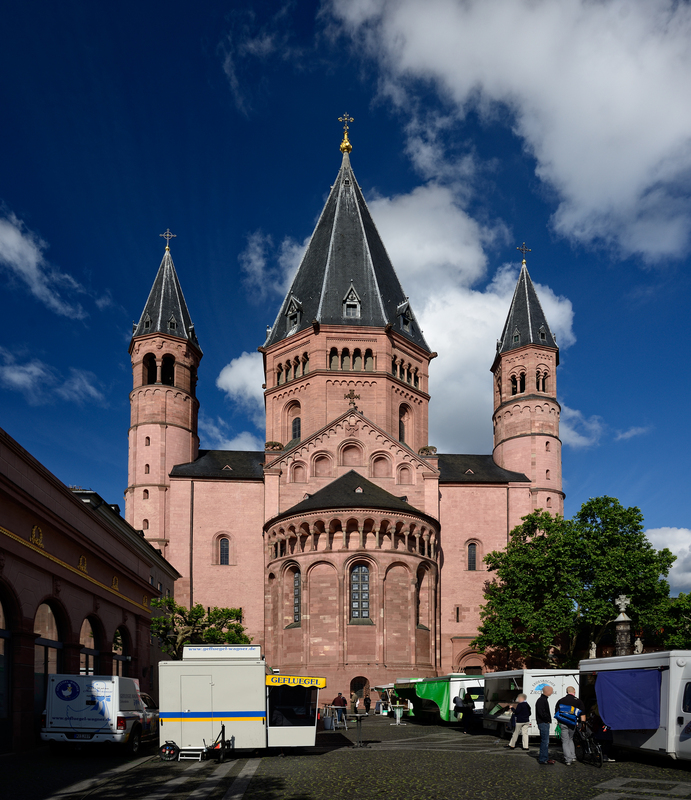 Boniface, the Anglo-Saxon missionary to the german lands in the 8th century was the first Archbishop of Mainz. His statue stands outside a 1000 year old chapel next to the cathedral. Gutenberg was born here and there is a museum dedicated to him. His printing press however was developed in Strassburg after his family was forced to emigrate, probably for political reasons. There are lots of other curiosities around town. There’s lots more. We spent hours at the cathedral and at St. Stephen’s Church but this is enough for now.